Plants do very well when grown under partial shade but are quite susceptible to nematodes. Regardless, it is a very slow grower. Also, may exhibit winter burn when grown in northern climates and for that reason is often covered in the winter. Member of the Buxaceae (boxwood family). Native to Europe, N. Africa and Western Asia. Related species are Pachysandra and Sarcococca. Stiff, oval leaves, up to 1 inch long, occur on woody branches. Stems are cut to various lengths. 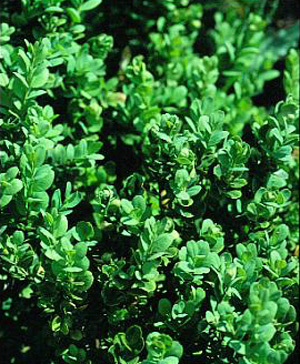 Plant is an evergreen shrub, classed as a dicotyledon, leaves not parallel veined. May produce an odor that some may not like. The specific epithet name “sempervirens” means evergreen. Very common as a hedge in formal gardens. The most common color is green but there are many variegated types. Often found as border plants in old, formal garden settings associated with large estates. Sometimes may give off what some might describe as a somewhat unpleasant odor. However, this attribute should not hinder its use in the floral industry.